A rich fat guy who represents himself as Steve Nash on basketball courts around Los Angeles is ruining Nash’s reputation for great ball-handling and passing skills. Jerome Willis, a phenom on the local courts, says that the fake Nash, whose real name is unknown, wears Nash’s Jersey and plays poorly in pickup games around the city. 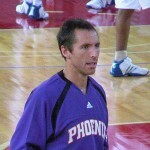 The real Steve Nash says he is upset because the false Nash plays in games with the younger guys and tells them, “Now you can say you played a pick up game with Steve Nash,” even though he often dribbles the ball off his own feet and makes unexpected and sloppy passes that often usually hit the other players in the face. In an interview with this reporter, conducted while the real Nash was standing in a line waiting to be picked by a team for a game, Mr. Nash said he “was just hoping to get picked for a team so that he could prove that he was the real Nash.” Unfortunately for Nash, he was not picked during the entire time this reporter had available for this story and was last seen walking away from the courts with his head down, accompanied by three other scrubs.